One of the borough’s largest employers has come in for high praise for showing its commitment to tackling the stigma of mental health in the work place. 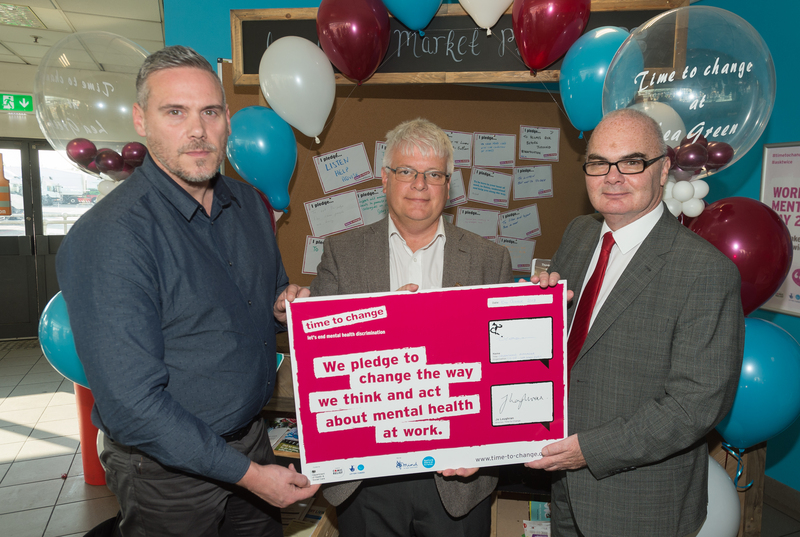 As a way of showing how highly its values employees – the Co-op Distribution Centre at Lea Green, which employs over 1,300 staff, has signed the ‘Time to Change’ pledge to coincide with World Mental Health Day. To help mark this significant occasion, St Helens Council Deputy Leader, Councillor Andy Bowden, portfolio holder for economic development, was invited down to the distribution centre for the pledge signing where he received a tour of the depot, and praised staff for their work around raising awareness of mental health. Over 800 employers around the UK to date have signed the Time to Change pledge to demonstrate their commitment to change how they think and act about mental health in the workplace and make sure that employees who are facing these problems feel supported. In August 2017, the Co-op recruited Georgia Hurst to improve staff engagement. One of the first things Georgia did was to set up a ‘market place’ based in the canteen as a hub for staff information, events and health campaigns such as the blood pressure awareness campaign, ‘Know your Numbers’. Through St Helens Council’s Business Liaison Officer, Sue Waller, the Co-op were able to access the health services on site including smoke free, physical activity plan, blood pressure checks and the use of the Wellpoint Kiosk. However, mental health is a priority at Lea Green to tackle stigma and discrimination and develop a culture where employees feel able to talk openly about their mental health problems. With the use of benchmarking standards, Georgia was able to plan activity and introduce new initiatives. The Co-op has since continued to increase activity on workplace health and has so far this year held successful initiatives including two mental health campaigns in May and October; the recruitment for mental health first aiders provided through Manchester College – and a ‘curry and a chat’ event in the canteen to offer staff the opportunity to have a curry and an open chat about mental health. Praising the Co-op for its approach to raising awareness of mental health, Councillor Bowden said: “I applaud the fantastic work that has been carried out here, and of course Sue, whose work underlines the council’s commitment to addressing mental health. In St Helens, there’s a unique opportunity for organisations to demonstrate their commitment to wellbeing in the workforce through a funded resource providing advice and practical support available, from benchmarking to free health checks. A wide range of services are available in St Helens for anyone wanting to talk about their mental health and wellbeing.